The Health Sciences Research Facility III is centrally located among the University of Maryland Baltimore’s (UMB) medicine, dentistry and pharmacy schools. Both the site plan and building design encourage collaboration, advancing UMB’s position as a leader in academic research. Designed as an architectural reflection of the collaborative enterprise it fosters, the new facility provides cutting-edge laboratory and multidisciplinary workspace for researchers exploring breakthrough treatments for cancer, diabetes and heart disease. The building, the largest facility ever constructed in Maryland’s university system, strengthens UMB’s footprint in West Baltimore and, with hundreds of employees, serves as an important economic engine for both the city and state. The design creates an efficient lab block oriented east-west that steps down to welcome visitors with a one-level massing along the street. A similar theme extends along the building’s southern face, where its form acknowledges an outdoor plaza with a porous cluster of offices that invite views into the building through the atrium. North to south, the massing balances connections to the medical school and space identified for future growth. Inside the building, a vast glass atrium connects a 12-story wet lab tower to a five-story dry lab tower via bridges that promote movement between lab areas. The atrium, flanked by labs and informal meeting spaces, further knits together the building with the neighboring schools of medicine, dentistry and pharmacy. A network of connected outdoor green spaces and courtyards encourages collaborative meetings and impromptu interactions among researchers, faculty members, students and the community. Transparent materials blur the boundaries between interior and exterior spaces, with the outdoor plazas functioning as extensions of major interior spaces. HOK designed the facility in association with Design Collective. Jacobs collaborated on the lab planning and programming. 434,930 sq. ft. / 40,405 sq. 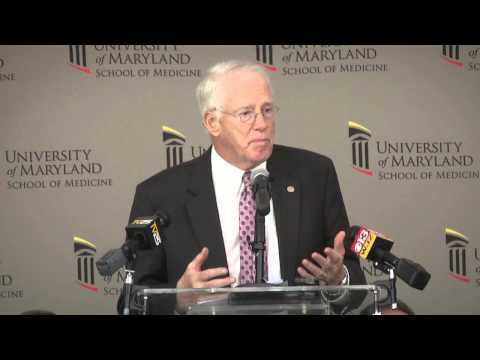 m.
Watch the groundbreaking ceremony for Health Sciences Research Facility III.